As the above quote suggests the better dressed and the more knowledgeable one is the better off you are. So below is some information to help you better understand clothing and the art of dressing well. Should you desire additional education do not hesitate to contact us. Off-the-rack or off-the-peg is a ready-made suit in standard sizes (suits are sized using the chest measurement). Any alterations to make the suit fit your specific body would be done. These alterations may be at additional costs. Made to Measure is the middle road. With a made-to-measure suit, you choose from among many available styles and an assortment of fabrics. Many personal measurements are taken and after 4 to 8 weeks you get a suit that is as close to perfect for you as possible without being custom tailored. Any additional tailoring is included. 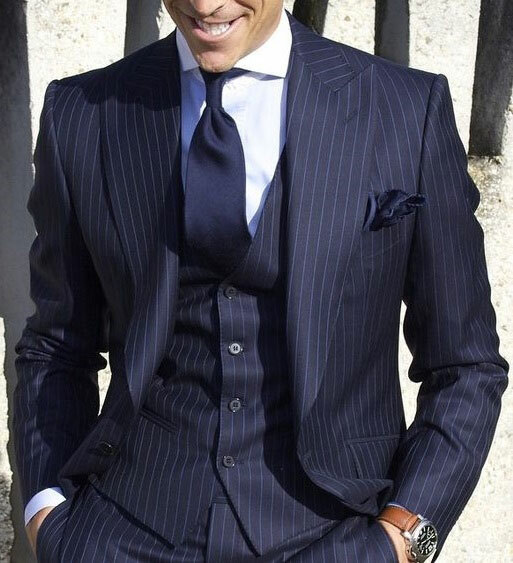 Bespoke suits are those that are custom made to a person’s specifications and measurements (as opposed to “off the rack” or “made to measure”). The word “Bespoke” simply means “spoken for” in common English. Interfacing describes the fabrics used between the lining and the outer fabric of a suit, jacket collar, lapels and shoulders, to give body and shape to the garment. Canvas used in quality garments can be made of wool, cotton, goat hair, horsehair, hemp, linen, or linen and hair. Unbleached muslin and crinoline fabric are used in less expensive garments but will not hold up as well to cleaning. The canvas can be full or half. Full canvas describes a suit jacket that has a canvas interlining in the entire front of the jacket from the shoulders to the bottom hem, and in the lapels. Half canvas describes a suit jacket that has only a chest piece (from shoulders to bottom of the rib cage). Often there is more than one layer of canvas. The lapels may be fused. Heavy interfacing, and linings and padding more easily hide defects in the sewing or cutting. That‘s why an unconstructed jacket (unlined) may require more tailoring skills than a fully lined jacket. Machines cannot insert and secure this middle layer. The canvas may be attached by two different methods, hand sewn or fused (glued). Floating canvas describes the method of sewing canvas thus allowing it to float and adapt to the wearer’s body. When the interfacing is suspended by hand stitching, it allows for a free-floating interface, which provides more drape in the body, more freedom of movement and a soft roll to the lapel. Consult Ricardo to save money on expensive hand tailoring some suit manufactures use fusing in their construction. Fusing is the method of attaching two layers of fabric by glue instead of hand stitching, usually on the front canvas chest piece and/or the lapels. Glue gives the garment a stiffer feel and appearance. Fusing is done by treating a synthetic mesh canvas with an adhesive and attaching it to the outer fabric by heat. There have been many improvements in this method since it was introduced in the 1950’s to make it feel like a hand-sewn garment. Many of the finest suits have some fusing in the manufacturing process. The main problem now with fused interfacing is dry cleaning. Heat and chemicals can cause puckering and shrinkage over time. However great strides in the quality of fused canvas suits has been made in the last few years and many high quality suit makers use some fusing. “Floating chest pieces” are common in fused suits. An interfacing is fused over large sections of the front and then in the chest, where the most padding is needed, then a separate piece held by the shoulder and armhole seams is added. That chest piece will “float” over a fused front. In a “canvas construction”, the canvas will float over the natural, unfused fabric. By dressing well, guys can give off the appearance of being confident, attractive, put-together men that any firm would want to hire and any woman would want to date. One’s attire is one of the first things noticed by others, and these first impressions are long-lasting. 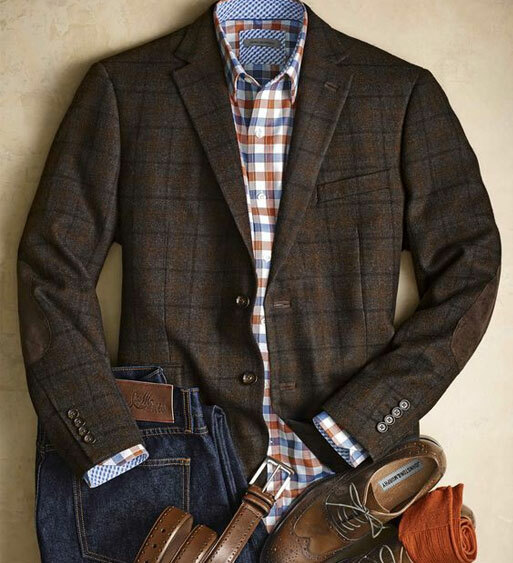 With a few simple steps, any guy can dress to impress every day. Dress according to the activities in your life, and the image you want to project. Dressing according to trends can be fun, but if it’s not appropriate for what you’re actually doing at the moment, it can make you look out of place. Be true to the person that you are and the things that you actually do. If you don’t actually play sports, avoid looking like you just walked off a basketball court. When dressing for work or for school, respect the culture of that environment. Make sure you are projecting the appearance of a professional, competent person who is aware of where he actually is. If you’re going to a job interview, ask your contact what kind of attire their applicants usually wear. Wear either business casual or business formal attire. It’s better to do over-dressed than under-dressed for an interview. For professional networking events, industry conventions, or formal dinners, invest in a good suit. Choose a darker, classy color for increased versatility; grey, dark blue, and black are excellent choices. You can wear a t-shirt of a band you like, or a little bit of camo if that reflects your interests, but always work it into your outfit so it looks like it’s in context. For formal occasions, don’t try to get away with being under-dressed. Show that you respect the event, and are involved in the moment. Dressing up will make you look more involved, approachable and confident. Consider your personality when picking your clothes. When you consult Ricardo, you don’t have to force yourself to be anything you’re not, and it’s very important that your clothes accentuate who you really are. Just make sure that you’re not wildly inappropriate or projecting an image that doesn’t do you justice. Wanting to dress well does not mean that you suddenly have to pay a whole lot of attention to fashion or be aware of all the trends. Dressing well also doesn’t mean that you have to follow a lot of rules for tailoring and “what every well-dressed man should have”. You shouldn’t have to worry just because you don’t have a classic button-down oxford shirt in your closet. If you have a casual, quiet, no-nonsense personality, it’s perfectly acceptable to have a simple wardrobe with just a few, well made, basic items. If you have a dramatic personality that likes to make a statement, it would make sense to have that reflected in your clothes. Just exercise a little restraint to make sure you don’t go overboard. Pick your statements carefully. Ricardo says that dressing well means showing that you are comfortable being yourself, not hiding behind what your clothes say. It’s good to wear clothes that reflect your interests, but avoid being a walking advertisement for a brand, a sports team, or musicians. Avoid wearing shirts that display offensive or sarcastic statements. You will be more attractive if you project a positive image to the world. Try not to look like you’re wearing a costume or uniform. Don’t dress all in camo if you’re not presently hunting or in the middle of actual combat. If there is a celebrity you admire, it’s perfectly fine to use them as inspiration. Just make sure that you take your own activities and physique into consideration. Know what clothes suit your body. You don’t need to have an ideal body to look good in what you’re wearing. Clothes can make a big difference in how your body looks, and can give the illusion that you are taller or thinner than you are. Think of dressing as creating an optical illusion. Look at the lines and shapes your clothes make on your body, and consider how they relate to optimal proportions. The ideal masculine proportion is tall, wider at the shoulders and narrower at the hips. Take an honest look at how your body matches up to this ideal, and look for clothes that hide and accentuate the right parts. Ricardo says it’s ok to play with these proportions a bit, depending on the occasion and your social group. Just be conscious about how your clothes make your body look, and think about how to compromise good proportion with fashion statements. Hip hop clothes, for example, tend to be a lot baggier, and can make a guy look bottom-heavy. Hipster clothes might make you look skinny. If this is the image you want to project, and you’re not going to a formal event or an office, that’s fine. Know that your fit is more than just your size. Clothing companies use average measurements to determine sizing and fit to try to cater to many people. Individual people, however, usually have bodies that are a bit different. The fit is the most important aspect of any article of clothing. No matter how cool the style is, if it doesn’t fit you, do not wear it. Take this advice by Ricardo: Look at how the clothes you try on make your body look, and be flexible when it comes to size. In one store you may be a medium, but in another you may be a large. Remember that cotton clothing will shrink a small amount the first time you wash and dry the fabric. If you plan on drying your cotton clothes, look for sizes that are slightly too big to accommodate shrinkage. If you dry clean certain items, you won’t have to worry about it. Find brands that cater to your body type. You will probably find that some brands and stores tend to fit you better than others, and it’s a good idea to shop mainly at those stores. Find a good tailor like Ricardo. Often clothes off the rack simply don’t fit, but can be made to fit with simple adjustments. Many good stores provide tailoring services at discounted rates if you buy from them. For shirts, the seam at the beginning of the sleeve should start right where your shoulder ends. The length of the shirt should extend beyond the belt but not beyond the buttocks. A good shirt will fit with the shoulder seam on the curve of the shoulder, and the cuff stopping just before the curve of the hand (where the hand meets the wrist). For pants, the waist should fit you comfortably right above the hips. The pant leg should extend down at least to the top of your shoe, but not to the ground. For shorts, choose a slightly wider leg than you would on a pair of pants. Shorts should stop somewhere between the top and middle of the knee. European cut shirts are a bit different from American cut. The European cut is a little slimmer and more form-fitting along the sides, while American cut is a little baggier, allowing for more room. Choose the right colors. The colors on your clothes reflect onto your skin, eyes, and hair, and depending on your particular features, some colors will be more flattering than others. Colors can also improve your mood, and wearing colors that are a bit trendy can help you look current. Experiment with different colors, and find the ones that suit you best. A good color should make your skin look healthy, not pale, blotchy, or sickly. Your eyes look clear and bright, not bloodshot or tired. If you have blue or green eyes, try wearing a blue shirt or tie to bring them out. Also, certain shades of red or brown might “cancel out” your eye color and make you look tired. The colors you wear should make you feel happy and at ease. Pay attention to how the colors you wear make you feel. Also, if you’re not comfortable wearing a particular color, don’t wear it, even if it‘s trendy or the color of your favorite team. Some people love wearing bright colors like yellow and orange, but they might make other people feel self-conscious. You’ll probably notice when you go shopping that there are some colors that are popular for a season, such as fluorescent colors or mustard yellows. Some up-to date color in your wardrobe is good, but always buy colors that make you feel and look good, regardless of the trends. Some colors are considered classic and never go out of style, such as brown, black, khaki, gray, and navy blue. These are great colors to use, but again, consider your skin tone and how you feel while wearing them. Buy the pieces you wear every day and expensive pieces in these colors. That way they will be versatile and you can wear them for a long time. Remember that even though these colors are “neutral” they can still be either flattering or unflattering on you. For example, black looks too severe on some people. Wear the highest quality clothes you can afford. Opt for high quality materials and sturdy construction. This is especially true for basic pieces like pants and more formal pieces that you expect to wear for a long time. You don’t necessarily have to spend a lot of money on clothes, but always look for quality. Plan to spend more money on more important pieces, and less money on trendy items or things you will wear through quickly, such as T-shirts. Second-hand stores are a great source of high quality items. Also, buying from an expensive brand doesn’t necessarily guarantee quality. Use your best judgment when picking clothes no matter where you shop. Don’t skimp when buying accessories, especially shoes. Often, the difference between looking put-together and looking cheap is in the details. High-quality accessories can make even simple clothes look great. While it may seem feminine, having a variety of shoes will help you dress appropriately for different occasions. Varying shoes day-to-day helps keep your look fresh, and your shoes will last longer. Sneakers are great for the casual, sporty look. However, try to stay away from wearing athletic sneakers all the time, unless you want to look like a teenager. Black formal shoes are a must for more formal occasions. While they’re expensive, they’re a great investment to make, especially if you take care of them. Try not to get formal shoes with a square or too-pointy toe: they won’t be classic forever. Desert boots or chukkas straddle the line between casual and formal, perfect for those nights out on the town when you want to spiff up your wardrobe without going overboard. Go for a nice neutral color like sand, brown, or grey. If your shoes look cheap or are uncomfortable this can bring down the whole outfit. Badly fitting shoes can also affect your posture and mood, which definitely detracts from your overall presentation. For formal occasions, always look for a great tie. This can add a lot of style to an ordinary suit. Be careful of hats and caps, and make sure they are well-made and appropriate. Wearing a cap backwards never looks classy. Also be aware of how a hat will make your hair look if you plan on taking it off. Be comfortable, but not sloppy. If you are uncomfortable, people can tell, and it makes you less attractive. However while it’s comfortable to wear sweatpants, a baggy t-shirt, and running shoes all the time, this makes you look lazy and unkempt. There are plenty of presentable clothes that are also comfortable. Making style as well as comfort a priority when choosing your clothes is very possible. Tuck in your shirt, unless it’s a t-shirt. You may hate tucking in your shirt, but a tucked-in shirt makes it look like you care about your appearance. Don’t try to hide your gut by keeping your shirt un-tucked–a tucked in shirt actually makes you look thinner. If clothes are made from a comfortable material but are still uncomfortable, this may be an issue with the fit. Always plan for the weather. If you’re sweaty or shivering, you won’t look well put-together. Remember that bad hygiene or posture can ruin even the best outfit. Always make sure that you are clean, well groomed, and holding yourself up straight. Have a good grooming routine. Smelling bad or looking dirty or sweaty is never attractive. Don’t wear too much cologne. A little is good, but too much is repellent. Get a haircut that is flattering and up-to-date. A good haircut should complement the shape of your face. A good hair stylist can help you choose one. Make sure your clothes are clean, ironed (if necessary), and in good repair. Don’t slouch, fidget, or have an overly exaggerated walk. Your clothes will look better if you carry yourself with ease and confidence. Make it a priority to leave your house feeling well-dressed. You never know who will see you, and you should always strive to make the best impression. One’s attire is one of the first things noticed by others, and these first impressions are long-lasting. You never know when you will run into the person of your dreams, a potential employer, or a local news crew looking to do a story on your life.